The benefits to employers of supporting employees with financial stress are significant. Employee financial stress impacts employers in many areas such as Productivity, Absenteeism, Performance and Employee Turnover. A key element to the success of an Employee Financial Wellness programme is to ensure it is unbiased and there is no conflict of interest. This will ensure the trust and confidence of employees and improve engagement rates. As Independent Financial Advisers, we can guarantee unbiased advice for your employees. "77% of millennials and 73% of Gen-Xs are likely to be attracted to companies that provide financial planning support"
What is an Employee Financial Wellness Programme? An Employee Financial Wellness Programme educates employees about overcoming personal finance challenges and provides them with expert knowledge and support to plan for their financial future. What are the benefits of Financial Wellness for employees? Reduced Stress & Financial Worries. Increase in Overall Health and Wellbeing. Reduction in Distractions due to Financial Stress. Improved Job Satisfaction and Workplace Engagement. Why offer an Employee Financial Wellness Programme ? 1 in 3 Employees report financial issues as a distraction at work. 46% spend 3+ hours per week dealing with personal financial issues at their workplace. 64% of Millennials are stressed about their finances. 46% said that their financial stress had increased in the last 12 months. 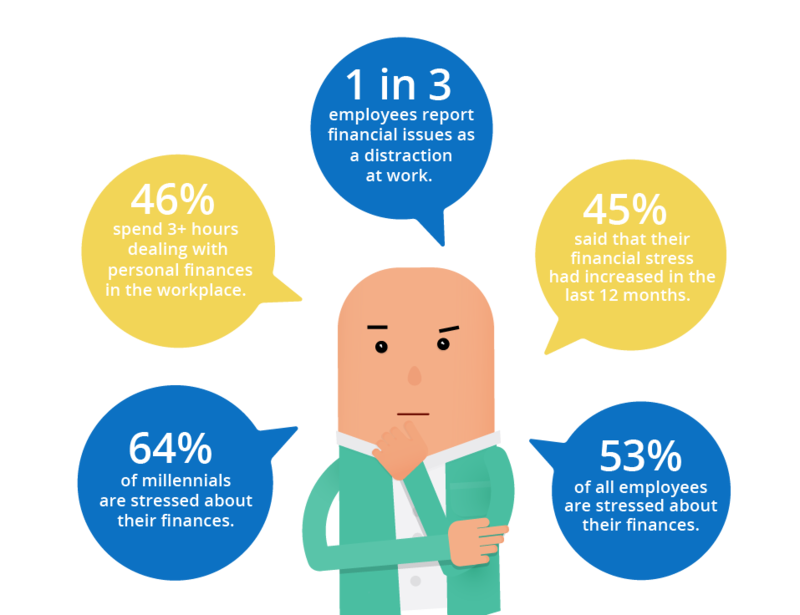 53% of all employees are stressed about their finances. How can I incorporate Employee Financial Wellness into my existing Employee Wellbeing programme? The team at New Beginning will work closely with you to integrate our Employee Financial Wellness Programme with your existing programme. The addition of Employee Financial Wellness will improve your programme and provide a holistic approach to employee wellbeing. What is the cost of your Employee Financial Wellness service? Our programmes are tailored and customised according to the needs of the employees and organisation. Please speak to us and we will be happy to discuss a service level and pricing package with you based on your needs. Our team is available to help you and your employees before, during and after you set up the Employee Financial Wellness programme. We also provide an extra level support through our HR Support offering. Contact Us for more information. How is the Employee Financial Wellness programme delivered? What is the core goal of the Employee Financial Wellness programme? We want to reduce, and where possible eliminate, employee financial stress which we know is distracting your staff while they work. How is the Employee Financial Wellness programme rolled out? We deliver Executive and Employee Group Financial Wellness Seminars. We then follow these seminars with individual clinics on site which provides staff with the opportunity to ask their own personal financial questions. The third stage of our programme provides One to One’s to your employees with the opportunity to engage with us to construct an individualised financial plan designed to highlight and work towards achieving their financial goals. Do you charge for initial assessments or employer proposals? We do not charge to meet with employers/HR professionals to discuss any element of our Employee Financial Wellness programme. What supports are available to employees through the Employee Financial Wellness? We provide access to financial planning calculators, research materials, blogs, articles and our presentations to employees post engagement. Do you provide standalone Wellness Week Seminars? We do provide standalone Financial Wellness Seminars for employers who are running in house Wellness Weeks. Seminars are delivered to groups of staff in the most convenient place possible, the workplace itself. Seminars allow us to present a series of sessions designed to educate employees on the various elements of their finances. Clinic are provided by our Employee Financial Wellness specialists. A clinic is based on site and we will provide employees with a booking tool to allow them to arrange a short meeting with us directly. Often, we find employees won’t ask questions at our seminars so the clinics provide your employees with the opportunity to meet with the experts individually for 20 – 30 mins to discuss any personal financial concerns they may have. What is a One to One? A one to one is a more detailed meeting with any employees who wish to have the theory of the seminars turned into a functioning personalised financial plan. The goal here is for us to help employees attain their financial goals and to address any financial concerns they may have therefore reducing or eliminating the financial stresses which we know are distracting them while they work. What is the difference between your Executive and your Employee Services? Our Executive seminars cover financial topics/issues which are more likely to be experienced by your senior executives. Topics covered include share schemes, overseas tax residency issues, overseas pensions and more complex investment strategies. Our Executive Financial Planning Service uses advanced financial planning tools including cash flow modelling and a detailed market investment analysis tool. What does your HR Consultancy Service entail? HR Professionals engage us to help them review, negotiate and make recommendations when it comes to renewing your company’s groups schemes. Group scheme covered include your Group Health Insurance, Group Risk and Group Pension schemes. Is your HR Consultancy Service available on a standalone basis? Do you provide analytics on employee engagement with your service?